Many kinds of birds sing. Some birds sing simple songs while others are capable of 200 varieties of songs. Studies suggest that certain properties of birdsong extend beyond the musical patterns to a biological model that might provide clues to the evolutionary origin of human speech. In this course, we will look at the basics of the science of birdsong. We will then discuss the degree and relevance of behavioral, neural and evolutionary analogies between birdsong and human speech by looking especially the song evolution in Bengalese finches. After that, we reinforce the idea with socio-emotional factors in birdsong. Finally, we will discuss what we can learn about evolution of human speech from birdsong studies. This is a Free course - all eligible students will have the option to purchase a $29 certificate signed by the Professor Okanoya that will be given at the end of the course with satisfactory performance. 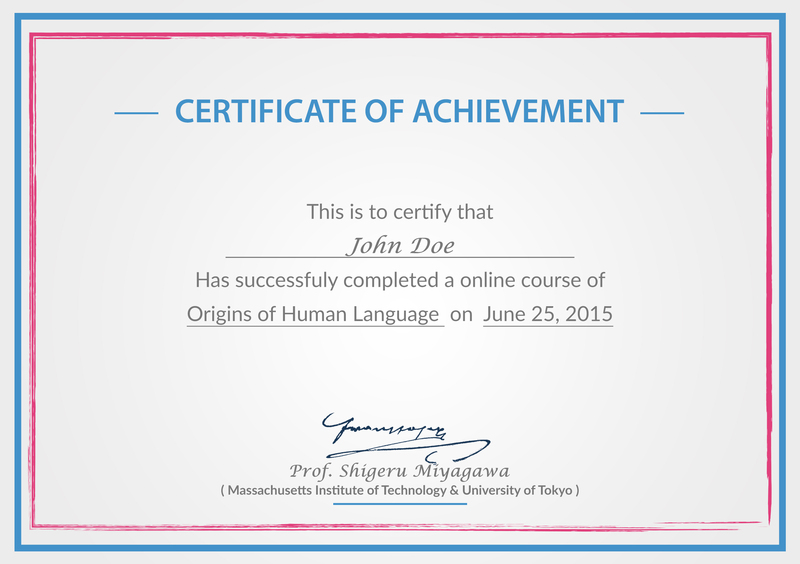 This is the second part of the three part Origins of Human Languages series. You can purchase certificates for all three courses at a special bundle price.